Table Talk with C and C: Writing Focus Cards with Motivators! Writing Focus Cards with Motivators! Are you still thinking of how to get your beginning writers to take on more responsibility of this arbitrary language? I think I've got just the right answer to help our little guys build in this early literacy foundation. I know I have posted several things about writing, but this is one of my main focuses as a special ed teacher and reading specialist. So here I go again.... 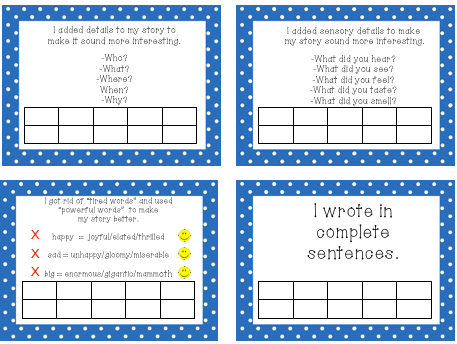 I have modified my Writing Strategy Focus Cards and added a new component! 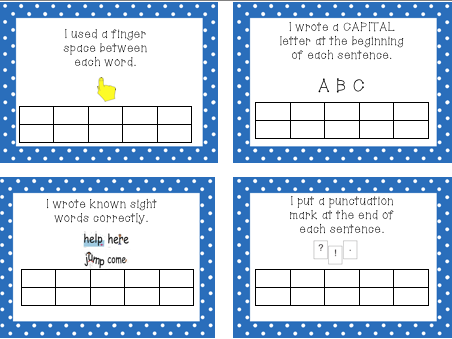 On each writing strategy task card I have added 10 boxes. These boxes are for the teacher's use to help the child work towards their ONE writing goal that they are working on. For example, let's say you have a student who is really struggling to use "lowercase letters throughout their writing." 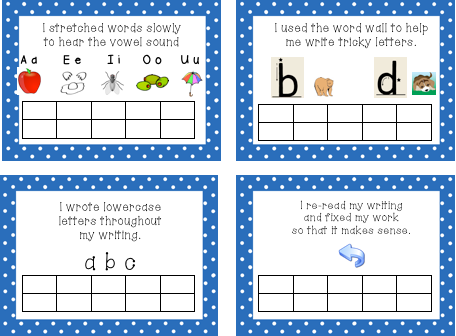 Their focus strategy card would be the card that says, "I used lowercase letters throughout my writing." When students receive their star it provides them with instant gratification that they worked hard towards their goal! I think it's important to keep the Writing Strategy Focus cards on each child's desk all day long. I would recommend laminating them and velcroing them to their desk so that they always have this visual reminder. 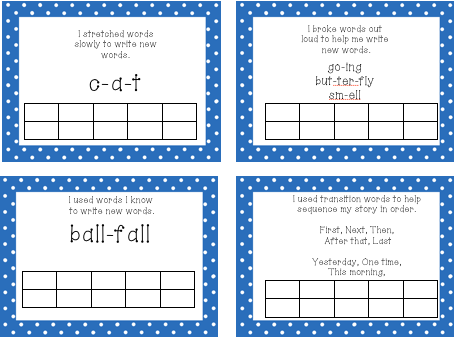 Another way you can make these writing strategy cards work is to have them keep it in their writing folder and every time it is time to write students will take it out, review their goal before writing, and keep their goal in mind as they write. During any time you have a writing task or assignment make sure your students are cognizant of their one writing goal. Encourage them and praise them for staying focused on their one goal. Walk around the room, do a brief conference with the student and reward them with a sticker or star in one of the boxes if they worked hard at their writing goal with minimal errors. Once the student gets to 10 stars you should praise them for their hard work and effort to meeting their goal. Then choose another writing goal from the "writing strategy focus cards" and tell your student(s) that this the next important area in writing that you would like them to work on. By providing our students with just ONE skill of the writing process at a time will help them stay focused and work towards an attainable goal. If we continue to expect our students to remember all of these skills at one time we are going to lose them quickly...as I have seen happen watching my first graders move onto 2nd grade and still having a lot of difficulty putting all of these skills together independently. My hopes are that we will see a bigger impact on their daily work and they will feel good about reaching their goal!! Next week Carie and I will be starting up our Writing Strategy Focus Cards and I can't wait to see how it goes! So give it a try and let me know how it goes! Grab my Writing Strategy Focus Cards in my TpT store!